Most would not associate the words “temporary” and “light” with visual arts and landscape. 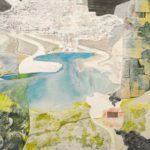 Unmonumental Landscape, an exhibit at Summit Artspace January 20–February 25, does just this. 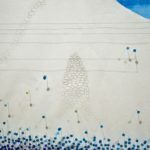 Coe Lapossy, Sommer Tolan, Chelsea Blackerby and Debra DeGregorio offer their unique perspectives on ethereal landscape art through three-dimensional installations, drawings and paintings. The public is invited to meet these young, emerging women artists at a free gallery reception on Friday, January 20 from 5 to 7 pm. The overriding theme of the exhibition is understanding one’s place in the contemporary world. The artists were brought together by Debra DeGregorio, a Kent State University BFA graduate who recently returned to Akron from attending graduate school in New York. She said the show also illustrates a current trend in art world of creating works that are more ethereal or temporary. “It seems like the pendulum of art has swung from expensive, precious materials presented literally on a pedestal to more accessible, less materially impressive media presented lightly,” DeGregorio said. DeGregorio’s interest in psychology and philosophy has paved the way for explorations in “the depiction of reality”. She uses bright colored prints and line drawings, making her highly philosophical themes approachable to the viewer. Through large-scale installations, Chelsea Blackerby explores homelessness and the resultant assemblage of the unconventional home. “I am deeply inspired by the creative housing solutions of vagabonds, squatters and displaced populations,” Blackerby said. Coe Lapossy’s technique is to experiment with paint — removing and adding layers. She uses contemporary popular culture references in her subject titles to suggest its influence on perceived reality. “I’m specifically interested in the struggle that we all partake in to find our way in this world and maintain or discover ourselves,” Lapossy said. Sommer Tolan, who also works at a plant shop, says her Surrealist-inspired watercolor paintings reflect the sense of serenity that watering plants brings her. Show card artwork by Debra DeGregorio.